In the bowl of a stand mixer, blend the yeast with the sugar, potato flour, vital wheat gluten, salt and 1 cup white whole wheat flour and ¾ cup all-purpose flour. In a medium saucepan over medium heat, melt the butter and then add the milk and stir. Turn the heat to low and stir in the eggs and egg yolks. Heat the mixture, stirring occasionally, until it reaches 120–130°F (49–54°C). Do not walk away! The eggs will cook if you let the mixture get too warm. Remove from the heat and stir in the vanilla. Add the liquid mixture to the bowl of the stand mixer and use a rubber spatula to stir it in. Stir in the remaining 1 cup of white whole wheat flour and the remaining 1 cup of all-purpose flour. The dough will be very sticky. Fit the stand mixer with the dough hook attachment and knead the dough for 10 minutes. The dough will still be quite sticky when finished. Place the dough in an oiled bowl, cover it with plastic wrap that has been sprayed with cooking spray or lightly oiled. Turn on your oven to the lowest setting for 1 minute and then turn it off. Place the bowl of dough on the center rack, close the oven door, and let the dough rise for 1 hour or until doubled. Meanwhile, prepare the filling by mixing all the ingredients together in a large bowl. (You can use your hands or a large spoon.) Set the filling aside. Mix together all the streusel ingredients in a small bowl and set aside. Prepare two 9x5-inch loaf pans with parchment paper. Using parchment paper allows for easy removal of the loaves. If you just grease the pans, you'll probably have difficulties removing the loaves if some of the chocolate melts against the pan. Prepare a silicone mat or piece of parchment paper by sprinkling flour over it. Once the dough has doubled, remove the bowl from the oven. Gently punch the dough down and then pull the edges of the dough to the center, making a ball. Divide the dough in half (about 21 ounces each half) and place one ball back in the bowl. Cover it up until ready to use. Place the other ball on the prepared silicone mat and knead the dough a few times to help release additional air bubbles. The dough should not be sticky at this point. If it's not very workable, add a little flour and knead it in. Sprinkle a little flour on top of the dough and lay another silicone mat, piece of parchment paper or a piece of plastic wrap on top of the dough. Use a rolling pin to roll it out to a 16x10-inch rectangle (this is approximately the size of a silicone mat). Reserve ½ cup of the filling and sprinkle half of the remaining filling evenly over the dough, leaving about a 1-inch border on all sides. Starting on one of the short sides, tightly roll up the dough, but only halfway. Roll the other half of the dough almost until the center. Sprinkle ¼ cup of the reserved filling on top of the side you just rolled up. Carefully place the first side you rolled up on top of the other side and pinch the two sides together to seal it well. It's okay if some chocolate crumbles escape. Gently twist the roll as if you were wringing out a towel. Cut off 1-inch of dough on both sides. This is to guarantee that the ends of the loaf are chocolatey and not just doughy. Roll the dough you cut off into a small ball and set aside. Form a 'u' shape with the dough. Take the closed end of the 'u' in one hand and the other end in the other hand and twist it as you did before. If it rips a little and a little chocolate falls out, don't worry. The streusel will cover it up! Place the babka in the prepared loaf pan and brush the top with the egg white mixture. Evenly distribute half of the streusel on top of the babka. Repeat with the other half of the dough and let the loaves sit, lightly covered with plastic wrap, for 30 minutes. Fifteen minutes into the rise time, preheat the oven to 350°F (175°C). Place the small balls of dough that you cut off earlier in a small baking dish, a sturdy muffin liner or whatever you'd like to bake them on and bake for only about 17–25 minutes. Bake the loaves for 40–45 minutes or until they sound hollow when tapped and the tops are golden brown. If they brown too quickly in the oven, cover the loaves with foil. Remove the breads from the oven and let them cool for 10 minutes in the pan and then remove, with the help of the parchment paper, to a wire rack to cool completely. Let the loaves cool completely before slicing into. 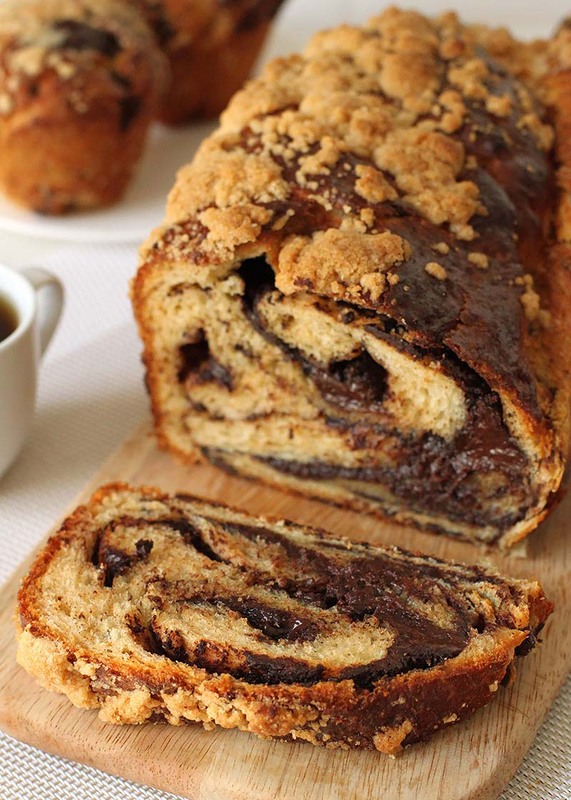 If you cut into them too early, you're likely to end up with dry babka on the next day. Wrap in plastic wrap and store in an airtight plastic bag at room temperature. Keeps fresh for 3-4 days. I don’t know what wheat gluten is. I don’t have any. How does it affect the bread if made without the added wheat gluten? Vital wheat gluten (VWG) is found in wheat, and is added to recipes – typically to whole wheat/ whole grain recipes – to provide added dough strength for a better rise. You can make the recipe without the VWG, you just may not get as good of a rise. I would recommend using bread flour in place of the all-purpose flour in the recipe to provide additional strength to your dough. You may need to adjust the liquids and also the kneading times. Just go by the feel of your dough. More tips can be found here: https://redstaryeast.com/yeast-baking-lessons/baking-steps-guide/. what can I replace with eggs, I am vegetarian? You can try replacing the eggs with ground flax seed. Combine 1 Tablespoon of ground flax seed with 3 Tablespoons of water to replace one large egg.